Raster data is commonly obtained by scanning maps or collecting aerial photographs and satellite images. Scanned map datasets don't normally contain spatial reference information (either embedded in the file or as a separate file). With aerial photography and satellite imagery, sometimes the location information delivered with the imagery is inadequate, and the data does not align properly with other data you have. Thus, to use some raster datasets in conjunction with your other spatial data, you may need to align or georeference them to a map coordinate system. A map coordinate system is defined using a map projection (a method by which the curved surface of the earth is portrayed on a flat surface). Save the georeferencing information when you're satisfied with the alignment. To watch a demonstration of georeferencing a raster dataset, see Georeferencing Rasters in ArcGIS. Generally, you will georeference your raster data using existing spatial data (target data)—such as georeferenced rasters or a vector feature class—that resides in the desired map coordinate system. The process involves identifying a series of ground control points—known x,y coordinates—that link locations on the raster dataset with locations in the spatially referenced data (target data). Control points are locations that can be accurately identified on the raster dataset and in real-world coordinates. Many different types of features can be used as identifiable locations, such as road intersections, the mouth of a stream, rock outcrops, the end of a jetty of land, the corner of an established field, street corners, or the intersection of two hedgerows. When you've created enough links, you can transform—or warp—the raster dataset to permanently match the map coordinates of the target data. 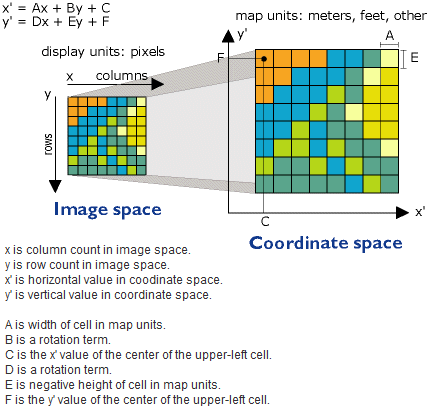 You have the choice of using a polynomial, a spline, an adjust, a projective, or a similarity transformation to determine the correct map coordinate location for each cell in the raster. The polynomial transformation uses a polynomial built on control points and a least-squares fitting (LSF) algorithm. It is optimized for global accuracy but does not guarantee local accuracy. The polynomial transformation yields two formulas: one for computing the output x-coordinate for an input (x,y) location and one for computing the y-coordinate for an input (x,y) location. The goal of the least-squares fitting algorithm is to derive a general formula that can be applied to all points, usually at the expense of slight movement of the to positions of the control points. The number of the noncorrelated control points required for this method must be one for a zero-order shift, three for a first-order affine, six for a second order, and 10 for a third order. The lower-order polynomials tend to give a random type error, while the higher-order polynomials tend to give an extrapolation error. A zero-order polynomial is used to shift your data. This is commonly used when your data is already georeferenced, but a small shift will better line up your data. Only one link is required to perform a zero-order polynomial shift. It may be a good idea to create a few links and then choose the one that looks the most accurate. With a minimum of three links, the mathematical equation used with a first-order transformation can exactly map each raster point to the target location. Any more than three links introduces errors, or residuals, that are distributed throughout all the links. However, you should add more than three links, because if one link is inaccurate, it has a much greater impact on the transformation. Thus, even though the mathematical transformation error may increase as you create more links, the overall accuracy of the transformation will increase as well. The projective transformation can warp lines so that they remain straight. In doing so, lines which were once parallel may no longer remain parallel. The projective transformation is especially useful for oblique imagery, scanned maps, and for some imagery products such as Landsat and Digital Globe. A minimum of four links are required to perform a projective transformation. When only four links are used, the root mean square (RMS) error will be zero. When more points are used, the RMS error will be slightly above zero. The similarity transformation is a first-order transformation that tries to preserve the shape of the original raster. The RMS error tends to be higher than other polynomial transformations since the preservation of shape is more important than the best fit. When the general formula is derived and applied to the control point, a measure of the error—the residual error—is returned. The error is the difference between where the from point ended up as opposed to the actual location that was specified—the to point position. The total error is computed by taking the root mean square sum of all the residuals to compute the RMS error. This value describes how consistent the transformation is between the different control points (links). When the error is particularly large, you can remove and add control points to adjust the error. The forward residual shows you the error in the same units as the data frame spatial reference. The inverse residual shows you the error in the pixel units. The forward-inverse residual is a measure of how close your accuracy is, measured in pixels. All residuals closer to zero are considered more accurate. When you rectify or transform, project, or resample a raster dataset; convert it from one projection to another; or change the cell size, you are performing a geometric transformation. Geometric transformation is the process of changing the geometry of a raster dataset from one coordinate space to another. Types of geometric transformations include rubber sheeting (usually used for georeferencing), projection (using the projection information to transform the data from one projection to another), translation (shifting all the coordinates equally), rotation (rotating all the coordinates by some angle), and changing the cell size of the dataset. Rectifying or warping will create a new raster dataset that is georeferenced using the map coordinates and the spatial reference. You can save this as a BIL, BIP, BMP, BSQ, DAT, GIF, GRID, IMG, JPEG, JPEG 2000, PNG, or TIFF file. ArcGIS doesn't require you to permanently transform your raster dataset to display it with other spatial data; however, you should do so if you plan to perform analysis with it or want to use it with another software package that doesn't recognize the external georeferencing information created in the world file. Updating the georeferencing will store the transformation information in external files—it will not create a new raster dataset, which happens when you permanently transform your raster dataset. For a raster dataset that is file based, such as TIFF, the transformation will generally be stored in an external XML file—with an .aux.xml extension. If the raster dataset is a raw image, such as BMP, and the transformation is affine, it will be written to a world file. For a raster dataset in a geodatabase, Update Georeferencing will store the geodata transformation to an internal auxiliary file of the raster dataset. Updating a raster layer, an image service, or a mosaic layer will only update the layer within your map document; it will not save the georeferencing information back to the source. An ArcGIS Desktop Standard or ArcGIS Desktop Advanced license is required for rectifying or updating georeferencing raster datasets in an enterprise database.